Leupold VX-6HD riflescopes are the next generation of the VX line. These scopes offer a variety of features that make them deserving of the legendary Leupold name. 1/4 MOA or .1 Mil exposed, repeatable and dependable turret. 6:1 zoom ratio with crystal clear image quality across the entire magnification range. CDS-ZL2 Zero Lock adjustment with revolution indicator. FireDot push button Illumination in select models. 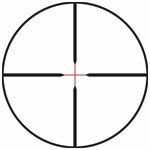 MST (Motion Sensor Technology)that will turn the reticle to stand-by mode after 5 minutes of inactivity on scopes with FireDot reticles. Reversible throw lever that clamps the power selector to provide leverage for fast magnification changes. Twilight Max Light Management System for optimal color rendition and light transmition. Twin bias spring erector system. With all of these features coming together, you receive a scope that will perform under any situation. The Leupold VX-6HD is a scope that is guaranteed to last a life time, will look great on your rifle and work every time you pick it up.